Round Rubber Stamp, Right Center: "U.S. Pension Office/ Jul/27/1923"
A Rubber stamp in lower left corner of the document: “Declaration accepted as a claim under Sec 2, act of May 1, 1920. Chief, Law Div/ Per ???" I have been ? suffering from Sciatic rheumatism, Kidney and bladder troubles for years but for the past eighteen months or more have been in such condition that I have required the regular care and attendance of a second person in dressing and otherwise attending to my physical needs. Sept 1861, in company “G” of the 44th regiment of Ohio Vol. has been affected with disease of lungs ever since. was sent home 3 months. pension under the provisions of the act of Congress approved May 1, 1920. July 2, 1921, or at any time during said period. soldier (or sailor) was a pensioner, the number of his pension certificate being 386046.
have no interest, direct or indirect, in the prosecutions of this claim. 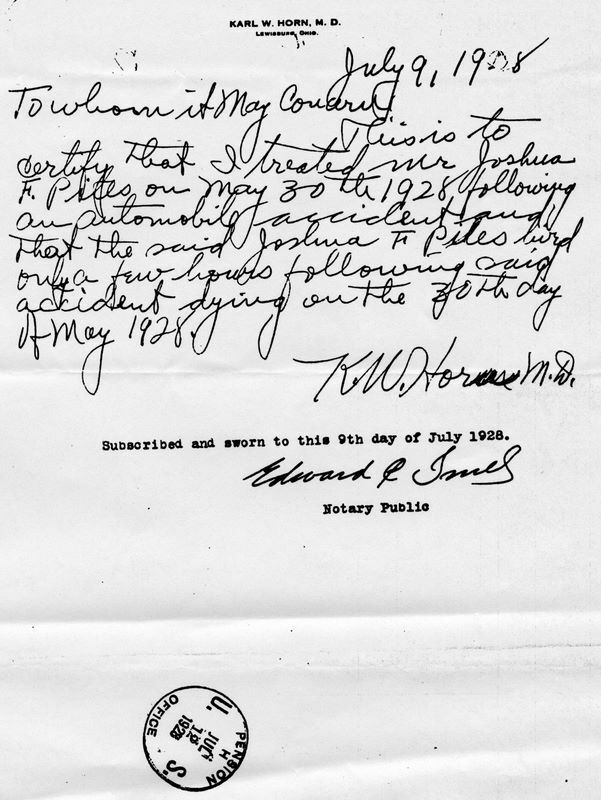 KARL W. HORN, M. D.
Subscribed and sworn to this 9th day of July 1928. United States, NARA, US Adjutant-General's Office. Compiled Records Showing Service of Military Units in Volunteer Union Organizations. 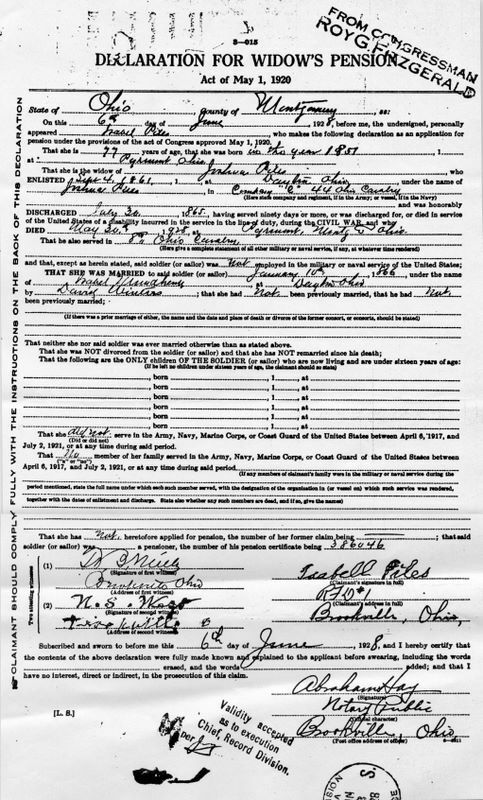 Original Record (Microfilm) NARA 594, roll 141, Ohio 6th to 12th cavalry, [Archive.org pages 808-843] http://www.archive.org/stream/compiledrecordss0141unit#page/n963/mode/2up , accessed 10 July 2010. Bk3405. Mustered in Sept. 18, 1861, at Camp Clark, O., by J.H. Young, Captain 15th Infantry, U.S.A. Consolidated with Co. C., 8th Ohio Volunteer Cavalry, Jan 4, 1864, at Cincinnati, O.
Co. C, 8 Ohio Cavalry. This card must not be taken from the files. on sick furlough dated Jan 20. Expires Feb 12, 1862." March & April/62 present: and same to Oct 31/62. him deserted from Beverly West VA Dec 12th/64. and same to June 30/65. 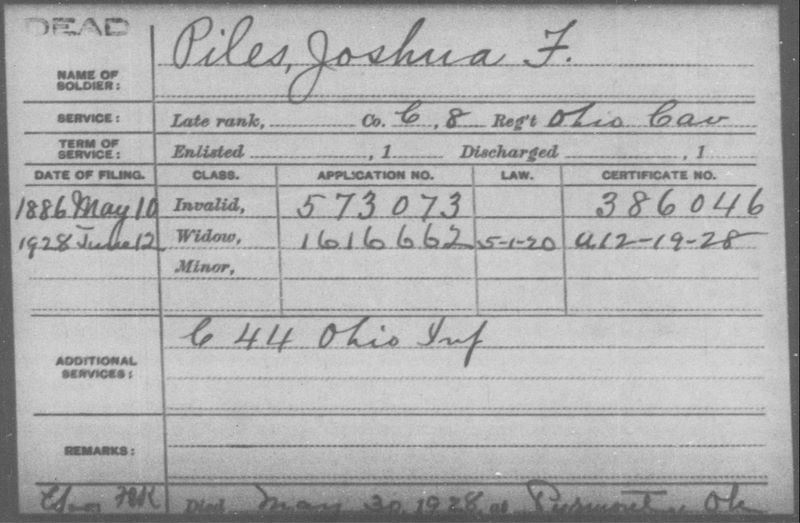 He was mustered out with Co.
J. Piles Co. "C" healed Feb 1" 1865, for "Scabies (Itch)"
No piles other than claimant - ??? 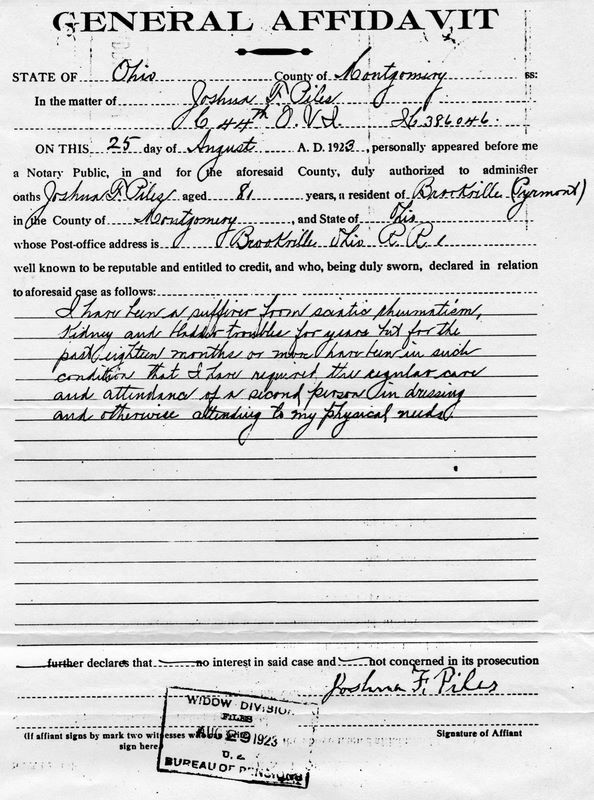 on roll of Co "C"
- 30 Jan 1864: Re-enlisted as a veteran. 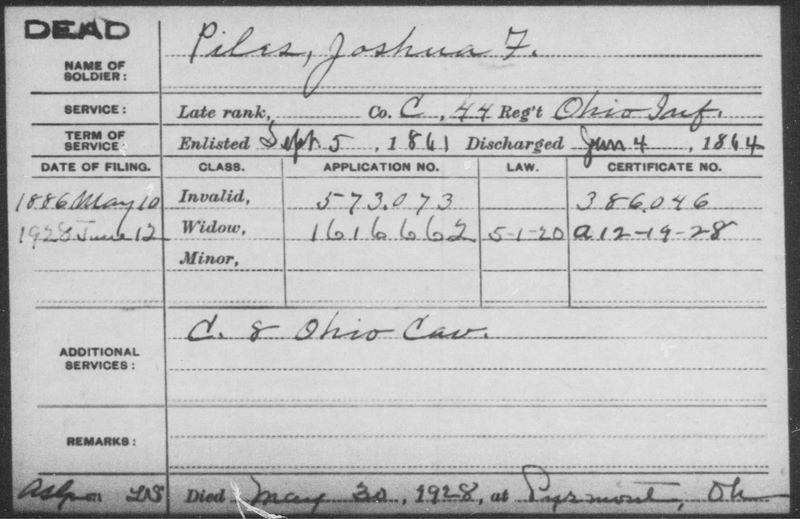 - Jan/Feb 1865: Present with remark - "Found from desertion 15 Jan 1865"
- 30 July 1865: Mustered out with company Clarksburg, W. Va.
Name/ ? ? Pension Agent,/ Columbus, Ohio. First. Are your Married? IF so, please state your wife's full name and her maiden name. Answer. 1866 Rev Winters Jan 11"
Fourth. Were you previously married? HW Frank Deputy Clerk Courts. I am the attendant of Joshua F. Piles. of these ailments I take care of him regularly. 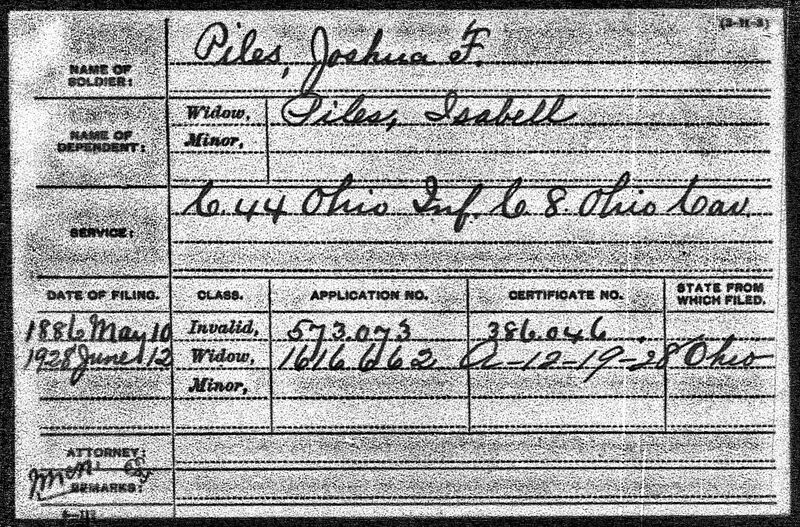 State of Ohio, County of Montgomery, SS. That neither one was ever married before. P.O. RFD #1, Brookville, Ohio . . .
ago, and that neither of them were ever married before.